Okay, I think I had a pretty great milestone today...longest ride on a bike ever, and it was by a lot. My previous best on a mountain bike was 34 miles and was basically an all day affair in Pisgah with the boys. My previous best on a road bike was 41 miles and happened at the Outer Banks while riding with Alan (and I'm pretty sure involved at least one reasonable break and him doing a lot of pulling). Today I went 48 miles on my mountain bike. I did it with one VERY brief stop to take a leak. Otherwise, no stops. About nine miles of it was on pavement with the rest on gravel road. Yeah, I know, that's not very interesting, but in my attempts to be environmentally friendly that was the only real option as it is very wet right now. In fact, I was lucky to fit this ride in at all without getting rained on. It did start raining on me on the way home, but never anything significant while riding. 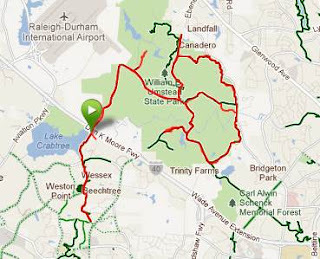 My route included two trips up and down the greenway in Cary that runs from Oak Hollow Apartments (where Ashley and I used to live!) to Lake Crabtree. That's all paved and pretty flat and totaled just over nine miles of the 48. The rest was just riding pretty much all the gravel road in Umstead State Park. I had to do a few pieces of it three times and most everything else twice to get that distance. Not too bad. I'll take it! I consumed about 70 ounces of water and five Honey Stinger waffles while riding. I blame Fatty for turning me on to the Honey Stinger waffles, too. You want to go ride 50 miles just so you can eat a bunch of them! That was a tough enough ride that I know I'm not ready for Leadville right now. But I've got eight more months, and things are happening at a rate that I'm very comfortable with right now. I need your help. Well, technically, young adult cancer fighters and survivors need your help. I've signed up with team First Descents to do the Leadville Trail 100 Mountain Bike Race. I've already blogged a bit about the race, but to summarize I'm going to try to do 103 miles of mountain biking in under 12 hours. Oh, and there's 14,000 feet of climbing and it all happens above 10,000 feet of altitude. You know, easy stuff like that. So how can you help? Donate through my page to Team First Descents! It's really that simple. It's a great organization that helps cancer fighters and survivors learn how to live and how to have the confidence they need to continue the fight. I'm really excited and honored to be able to help out such a great cause, and I hope you can spare a few bucks to help, too.